Amir Khan (born 8 December 1986) is a British professional boxer, born in 1986 in Bolton, England. He is a two-time former world champion, having held the unified WBA and IBF light-welterweight titles. He currently holds the WBC Silver welterweight title, and has fought at three weight classes: lightweight, light-welterweight, and welterweight. Khan confirms his split from Makhdoom, after claiming she cheated on him with Joshua. In a preview of an upcoming interview with King. 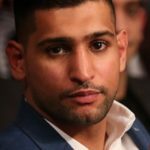 Khan says Mayweather will easily beat McGregor. McGregor’s never had a boxing fight as a professional. That’s his first fight. He’s up against someone who is unbeaten in 49 fights…Being a boxing fight, it’s gonna be all Floyd. He’s gonna walk through him. He’s gonna make him miss…it’s gonna be a walk in the park for him. Khan says the three men who attacked him during a road rage incident were lucky he didn’t beat them up. Khan had made a wrong turn, leading to one of the men punching him, and the others attacking his car. I was raging, I was really angry. I don’t want to throw punches because I can definitely hurt someone quite badly. My hands are weapons. They’re weapons. We were called at 7.15pm on Friday to a report of road rage and assault, an incident that had occurred at 6.15pm that evening in Bolton. A man in his 30s was driving his car when he made a wrong turn. This angered a driver who was behind them. There was an altercation and the man behind punched the man in his 30s. His vehicle was damaged by a group of men – possibly three. There were no arrests. Anyone with information should contact us by calling 101. Kahn and Lobov trade insults on Twitter. @amirkingkhan @ufc I am sorry for hurting your feelings, I didnt mean that, its your glass chin I want! Khan says again that he is interested in joining the UFC and wants to fight McGregor. I always said I’d give it a go, I’m a fighter who likes to fight and try different things. I don’t know if I’d be any good at it but I’d give it my all. [McGregor] wouldn’t know – I’d just hit him – bam-bam-bam-bam, but if he grabbed me I’m done, I’d have to work on that. Nate [Diaz] choked him out and Nate said to me ‘he’s not the best when you get him on the floor’, so he’s normally a stand up fighter. In boxing I think I beat him quite easily in boxing but in MMA I think it might be tough but you just don’t know. Conor’s a fighter who’s put the UFC on the map, he knows how to market himself. This is what fighting is all about, it’s all about promoting yourself, sometimes being that bad guy and making yourself a big name. A fan video predicts the result of a fight between McGregor and Khan. At his King’s Boxing Gym in Oakland California, Khan says McGregor cannot beat Mayweather. McGregor keeps saying he wants to come into boxing but he’s all talk. I know he’s doing a little bit of boxing here and there, but boxing and MMA are two different sports. I think that [McGregor] not made as a boxer, but he might do well, he’s got that punch power that everyone says. [Mayweather] can break anyone down, take away that power, pick them off and I think McGregor just falls short in boxing. It’s his first fight he’s having as a professional boxer, 12 rounds, against the best boxer, with the best defence. [McGregor] could start off maybe taking one or two warm up fights then taking someone decent then taking Mayweather at the end. Floyd is one of the best fighters in the decade we’ve had in boxing and McGregor wants to fight the best out there. Floyd’s getting a bit older now, he might not be physically stronger now, or physically in great shape but I know one thing about Floyd – he’s mentally a great fighter. Khan says that he believes that Mayweather will come back to fight McGregor, and that Mayweather will win the fight. If [Mayweather] is coming back, he wants a huge, huge fight, a mega fight, and I think a mega fight would be against someone like McGregor. But with McGregor, he’s not going to be as good in boxing as he is in MMA. It will be a one-sided fight if Mayweather fights him…I met Mayweather and he came over to me and said ‘you’re a great champion, look the fight between me and you didn’t happen. He was very very respectful and said he’s love to work with me in the future, but I just don’t see him coming back. As he announces the launch of a new MMA league in Britain, Khan says he is willing to fight McGregor in MMA. MMA is big and getting bigger. Fighters like Conor McGregor are making a lot of noise. MMA is hitting some high numbers on pay per view. I am always going to be involved in boxing but to have my foot in the door with MMA is brilliant…McGregor is a massive name in MMA and I’m a big name in boxing, so, globally, I think it would be a massive fight. Khan says he would still like to fight McGregor. I don’t really know about moving to MMA. I mean, if the fight comes up I would consider it as Conor is an unbelievable fighter. I’d love to test him in the boxing ring first as MMA will take a long time to get used to. Just the thought of getting the boxing world and MMA world together makes we want to do it even more as it will be massive! However, Khan is currently recovering from a hand injury and reportedly won’t fight again until next year. Khan says he wants to talk to McGregor, possibly about an upcoming bout. Gracie says McGregor would easily beat Khan in MMA, but would be beating in a boxing ring. If it was a boxing match I’d put my money on Amir Khan. But a MMA match, it’s a totally different ball game. Because McGregor’s been training for a long time already, so he’s smart, he’s very good. He’s top right now. Amir Khan right now wouldn’t stand a chance against him, sorry. Not in a MMA match. But, having said that, anything can happen, there’s only one way to find out. There is a big difference, if you put the best MMA fighter in the boxing ring to fight a top boxer boxing rules it’s a totally different ball game. Or a karate fighter to fight tae kwon do rules or fight boxing rules. A boxer to fight tae kwon do rules, it’s totally different, man. Khan says he could make the switch from boxing to mixed martial arts in the future, and says that he thinks he can compete against McGregor. I’ve always been a UFC fan and I like McGregor and the way he promotes it. If I was to fight the champion around 147 pounds I would fancy my chances. You never know what will happen in the future—I would never say ‘no’ to getting into MMA. I could do it under my own banner and what a way to do it. My speed would be perfect, it’s hit and move…Just look at when McGregor beat Jose Aldo. The guy leant forward, over extended and fell short, McGregor stepped back and threw the straight right. It was a proper boxing move. I would not let anyone get close to me, I would take a step back and keep it long. I also believe that us boxers punch harder than MMA fighters anyway.